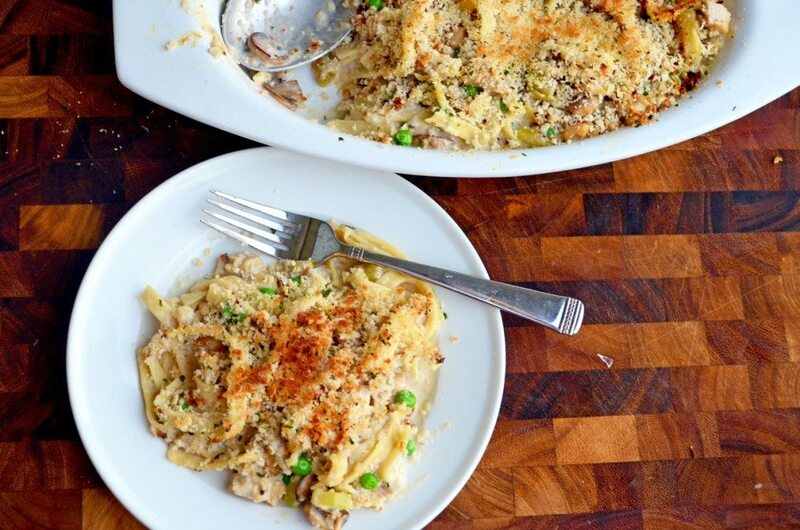 This Copycat Stouffer’s Escalloped Chicken and Noodles is the ultimate comfort food- can be done with rotisserie chicken and as a one pot meal! 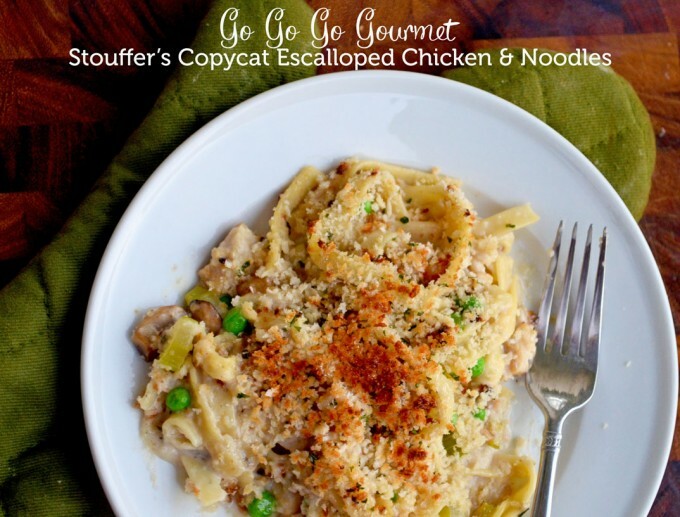 I remember my mom and I being obsessed with Stouffer’sEscalloped Chicken and Noodles when I was younger. When Dad went out of town for work or golf, it was a reasonable guess as to what might be for dinner. I remember my mom and I being obsessed with the Escalloped Chicken and Noodles from Stouffer’s when I was younger. When Dad went out of town for work or golf, it was a reasonable guess as to what might be for dinner. It’s seriously delicious. Why is everything from Stouffer’s so completely amazing?? I still love it even now, so why not go for a homemade copycat version of their escalloped chicken and noodles ? I’ve tried several times before, but this one nailed it, in my opinion. Creamy sauce,studded with tender chicken, vegetables and pasta? Heaven. A good, solid, three times. But hey, sometimes that is a small price to pay to be able to dance around the kitchen with your toddler, loudly singing “Somebody to Love” by Queen. At least with this, you just scrape off the burned panko, sprinkle a new layer on, and try again. But then “Lay Lady Lay” by Bob Dylan comes on, and for once, your son wants to be held and sway around the kitchen island with you. Those moments are worth burning dinner a hundred times. 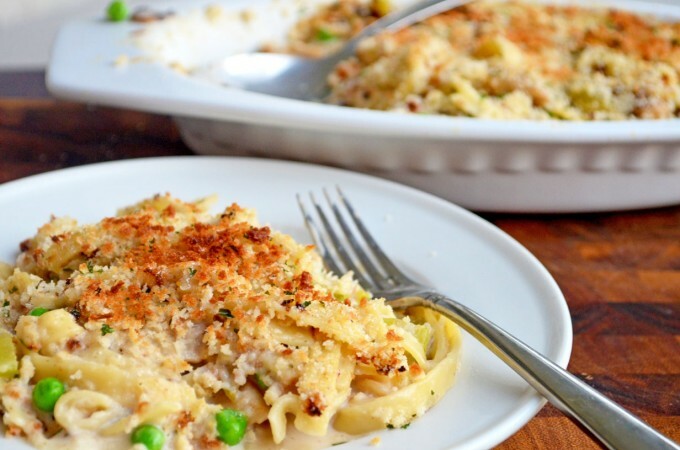 Note: This recipe can be amended to be even easier, using shredded rotisserie chicken (yay! ), as well as being a one pot recipe (yay! less dishes to clean!) You will definitely need to add more liquid if you go for the one pot method, as those noodles will just continue to sop up all the liquid that they can. If you would rather not babysit this under the broiler for 120 seconds of your life, you can also bake it at 375 for 10-12 minutes, until golden. However, be warned that if you go this route, there will be less sauce. Bring a pot of salted water to a boil. 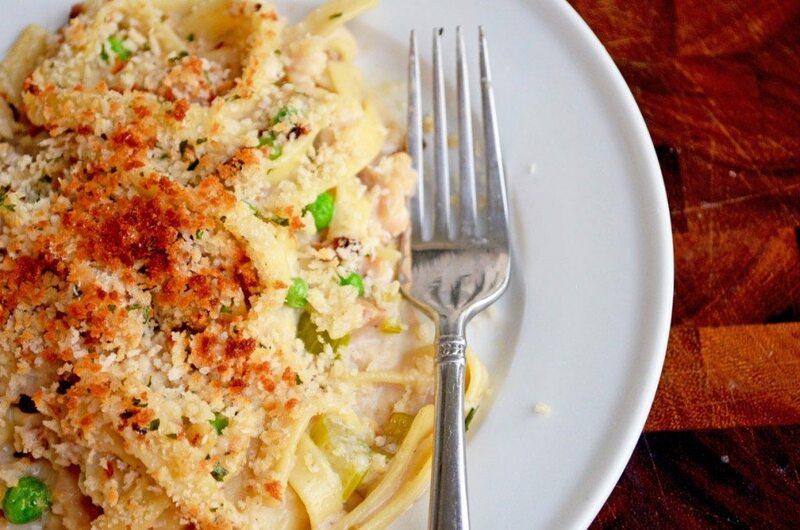 Cook fettuccine until al dente. Drain; set aside. In a large skillet over medium heat, melt 2 T of butter. Season diced chicken with salt & pepper. Add celery, carrots and mushrooms to skillet, and saute until mushroom are beginning to brown. Add chicken. Saute all until mushrooms are browned and celery has begun to soften. Add remaining butter to pan. Sprinkle flour over top, then stir in. Cook for 1 minute to cook off raw flour taste. Slowly add chicken broth to pan, stirring constantly. Add in 1½ cups milk and garlic powder. Simmer uncovered until sauce has thickened to look like a thin gravy. Add noodles and frozen peas. Add more milk if mixture seems too dry. Pour chicken and noodles into an ovenproof dish. Sprinkle with panko and spray top with cooking spray. Place under broiler for 1-2 minutes until golden brown. You can do this as a one pot recipe as well- just add an extra cup of milk (probably 2 3/4-3 cups) and simmer until noodles are tender. Thin egg noodles might be preferable there since they will cook faster. I also do this with shredded rotisserie chicken. Instead of adding chicken with vegetables early in the recipe, add it with the garlic powder and milk in Step 4. 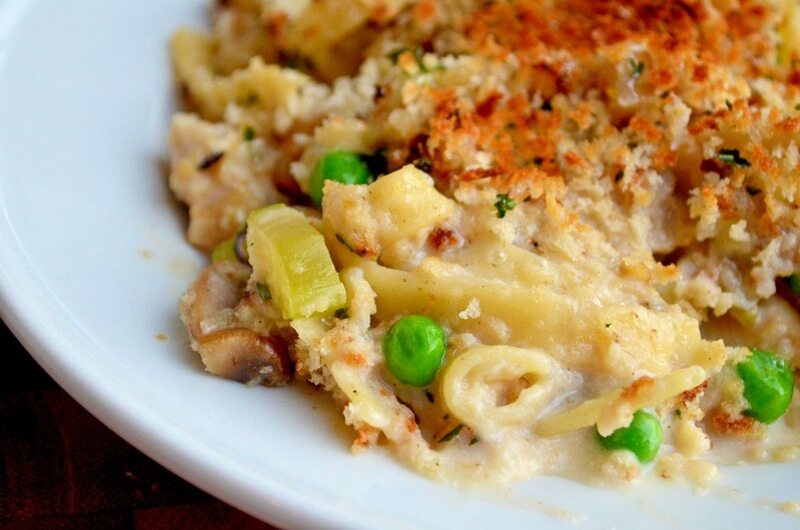 What a delicious and comforting dinner this would make! Good thing I have all the ingredients on hand so I can make it. I think thats one of the best things about this recipe, I almost always have everything already! Thank you so much! I’ll be sure to check it out. I am doing this as a make the night before dinner. Instead of boiling the noodles, I soaked them in hot water while I did all the prep. Added a bit more liquid to the sauce, combined everything and will let it rest in the fridge overnight. It looks like is going to set up perfectly. I will put the panko on top tomorrow before I bake it and then broil the last few minutes. This Stouffer’s dish has always been my favorite, but have a hard time finding it now. So delighted to have this recipe to try, especially since I can control the sodium. Would be good with a crushed potato chip topping….you know, the crumbs that are always left at the bottom of the bag!